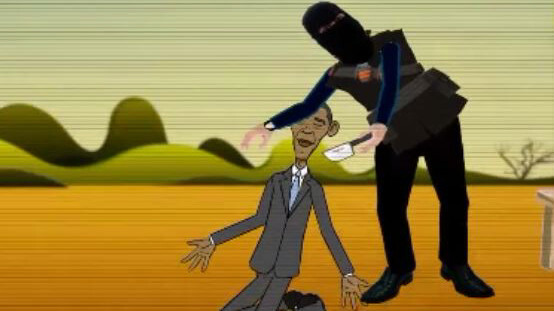 Calling U.S. President Barack Obama the “mule of the Jews,” ISIS has released a video cartoon posted on the Internet showing Obama begging for mercy before being beheaded by ISIS executioner Jihadi John. At the end of the cartoon, Obama is shown awakening from his nightmare and fleeing the room. “Obama” weeping, his head is held by “Jihadi John” wielding a knife. “Jihadi John”: Shut up mule! Jihadi John lets go of Obama, who faints. “Obama” (in a childish voice): Dad! Jihadi John is going to slaughter me. Save me! Save me! “Jihadi John” decapitates “Obama” with his knife. “Obama’s body with a severed head is sprawled in a puddle of blood. “Obama” is sitting in the “Oval Office” with a framed skyline of a US city. He starts to cry and escapes the office. Rather than direct readers to various Isis/Jihadi websites where the film is posted, if you want to watch it, I would recommend viewing it at the website of the pro-democracy group Memri, here. A video that the Islamic State said they made and that was posted on social media sites yesterday, shows Islamic executioners shooting and beheading 30 Ethiopian Christians in Libya. In the video, the Islamists call Christians “crusaders” who they claim want to kill Muslims. 15 Christians are shown being beheaded on a beach and another group of 15 are shot in the head in an area of scrubland. In the video, a stretch of beach turns red with their blood. The video concludes with a warning that Christians will not be safe unless they embrace Islam or pay protection money (a “jizya” tax to Muslims of the kind that Jews and Christians were historically forced to pay in many parts of the Arab world). The video then shows scenes of Isis fighters destroying churches, crosses and paintings depicting the Virgin Mary. The video has the same level of highly professional production as many other IS videos have had. * Italian police last week charged a group of Muslim migrants with murder after they threw at least 12 Christians overboard to their deaths during their Mediterranean crossing. * An Islamic State affiliate claimed responsibility for the killing of three Egyptian soldiers in the Sinai, the Egyptian Independent newspaper reported today. The commander of Iran’s ground forces, Brigadier General Ahmad Reza Pourdastan, on Friday accused the United States of creating the Islamic State, Boko Haram and al-Nusra front. “The ISIL [Islamic State], Boko Haram and al-Nusrah have been created in line with the U.S. strategy of religion against religion, which seeks to impair the divine face of Islam,” Iran’s official Fars news agency reported Pourdastan as saying. “The American and European people’s high tendency towards Islam and (the need for) protection of the Zionist regime’s security have caused the U.S. to create the terrorist groups,” he added, in an address to students at Tehran University. Khamenei himself has continued to call for “Death to America,” even as President Obama says Khamenei is a leader he can trust to keep his word on a largely unverifiable nuclear weapons deal. Last week, Israel’s Prime Minister Benjamin Netanyahu said that the West was “delusional” if it thought capitulating to Iran would stop it from acquiring nuclear weapons. A televised broadcast of the parade was punctuated by repeated cries of “Death to America” and “Death to Israel,” reported the Associated Press. “Those in Tel Aviv and Haifa will not sleep at night, not one person,” the announcer on Iranian national television said during the broadcast, as heavy trucks carrying armored personnel carriers rolled past. Among those speaking at the event was President Hassan Rouhani, who commentators and correspondents for the New York Times, Guardian and BBC never seem to tire of trying to persuade themselves and the general public, is a “moderate”. Among the weapons systems paraded past dignitaries was a domestically produced version of the Russian S-300 anti-aircraft missile, the Bavar 373. Russia announced last week that it would supply the S-300s to Iran. Russia’s announcement was bitterly denounced by Israeli Prime Minister Netanyahu who telephoned President Vladimir Putin to ask him to cancel the shipment. And leading foreign policy expert Max Boot wrote this morning in a piece titled “Innocent Abroad: Obama’s Iran Disaster”: “I’m guessing that President Obama, despite his roots in Kenya and Indonesia, has never negotiated for a carpet or anything else in a Middle Eastern bazaar. If his negotiations with Iran are any indication, he is the kind of innocent abroad who pays $100,000 for a carpet that’s worth $100. “Already his talks with Iran have been characterized by American concession after American concession. Talks that started with the express goal of dismantling the Iranian nuclear program and exporting their stockpile of enriched uranium are ending up with the program wholly intact and the enriched uranium still in Iran..
“But that still isn’t enough for the rapacious mullahs. Among other conditions, they are demanding that sanctions be lifted the minute the agreement gets signed. Obama has been insisting that the U.S. would lift sanctions only in stages, as Iranian compliance is verified. But on Friday Obama signaled that he is willing to make preemptive concessions on this issue so as to ensure that a deal gets done by his artificial deadline of the end of June…. The head of the Joint (Arab) List in the Israeli Knesset, Ayman Odeh, has said that “The Holocaust is an event without parallel. Anyone who denies any part of it… is directly connected to a mechanism of evil”. He called on Arab-Israeli citizens to participate in the national moment of silence on Israel’s Holocaust Remembrance Day, and criticized Arabs who made fun of it or denied it. “As chairman of the Joint List, I call on the entire population – especially the Arab population – to stand at attention during the siren,” Odeh told Israel’s Channel 10 TV. The MK said Arab-Israelis have a responsibility to both respect and understand the full extent of the Holocaust. Odeh added that Jewish-Israelis also need to learn more about the history of the Arabs. Tom Gross adds: I suggested to some people in the Israel’s prime minister’s office, after last month’s Israeli election, that Benjamin Netanyahu (whose last government did more than any other previous Israeli government in terms of investment in the Arab sector) might wish to offer Ayman Odeh a cabinet post, perhaps in charge of Arab affairs, in his new government, even if the Joint List were not to formally join the government. I still hope that might be a possibility. Odeh’s remarks are particularly significant considering that in nearby Ramallah, the Palestinian Authority continues to propagate Holocaust denial. Sometimes the official (and partially EU-funded) Palestinian media denies the Holocaust altogether, at other times it engages in Holocaust inversion (claiming the Jews are the real Nazis), or Holocaust revisionism. The PA daily added that Zionists orchestrated their own genocide to gain international sympathy. Though he continues to be romanticized by many writers for the New York Times and other western media, it should be remembered that Palestinian President Mahmoud Abbas (now in the 11th year of his four year-term) wrote a doctoral thesis denying the Holocaust. Police have confirmed that the car attack in Jerusalem last week on young Jews returning home by bus after attending a Holocaust Memorial event, was a deliberate terror attack. The driver, 37-year-old Khaled Koutineh, ploughed his car into waiting commuters killing 25-year-old Shalom Cherki and severely injuring a 20-year-old woman, Shira Klein. Not all members of the Israeli Knesset (MKs) for the Joint List are as accommodating as Ayman Odeh. For example, radical MK Hanin Zoabi continues to fly around the world as a guest of Western NGOs, claiming that Israel is an apartheid state, despite the fact that she, an Israeli-Arab, has been reelected to the Knesset. One wonders if she understands what apartheid was actually like for Black South Africans. Sayed Kashua, an Israeli-Arab who writes a weekly column for Haaretz, and is presently living and working in Chicago, wrote in his Haaretz column this past weekend that his teenage daughter told him she was upset that her history teacher in her Chicago area public high school, claimed that there were no gas chambers. Her teacher told pupils that there was only treatment for lice and that six million people were not killed in World War II – they were just hungry since no one had food then. Kashua did not name the teacher but said he was a white man. Tom Gross adds: Online Holocaust denial is spreading fast, according to experts, especially in regions such as Latin America. And on Thursday, Twitter announced it would be cracking down on racist and anti-Semitic posts and threats, saying it would triple its response team, aiming to combat “abuse without chilling or silencing speech”. The Moroccan authorities have announced they will ban a scheduled show on April 29 in Casablanca by the French anti-Semitic “comedian” Dieudonne. Dieudonne has more than 10 convictions in France for inciting racial hate against Jews. Dieudonne’s current show, titled “The Impure Beast,” contains profanities connected to Ilan Halimi, a young Parisian Jewish phone salesman tortured and murdered in 2006 by a gang of kidnappers that targeted him because he was Jewish. You can read the full Washington Post piece, which is adapted from a speech given last Wednesday at the U.S. Holocaust Memorial Museum, here. Yesterday, the British newspaper The Mail on Sunday (sister paper of the Daily Mail) revealed that at least 113 Holocaust deniers gathered in London for a secret conference in the Orient Suite in London’s four-star Grosvenor Hotel. Among the speakers were people from the UK, Spain, Canada and the U.S. Questions are being asked why the British government has refused entry visas to the UK for bloggers such as Robert Spencer and Pamela Geller, but allowed into the country genuine-hate mongers such as Mark Weber, the California-based head of the Holocaust-denial organization Institute for Historical Review, who told the conference “No task is more important or pressing than to identify, counter and break [the Jews]”. Britain is one of the European countries where Holocaust denial is not illegal. According to reports, Holocaust denial is illegal in Austria, Belgium, the Czech Republic, France, Germany, Hungary, Liechtenstein, Lithuania, Luxembourg, The Netherlands, Poland, Portugal, Romania and Switzerland. As part of her campaign to win seats in the forthcoming British elections, the leader of the UK Green Party, Natalie Bennett, has singled out Israel, and Israel alone from all the world’s countries, for boycott. Bennett last week affirmed her support for boycotts of Israeli artists, musicians and academics. Interestingly, Bennett who was born and grew up in Australia and has happily travelled to dictatorships all over Asia, has refused to ever go to Israel to see the reality of the situation there for herself. It is worth watching this one-minute video extract of the Green Party deputy leader threatening British Jews for supporting Israel. The Green Party remains a relatively small party, but its support on the British left has grown recently.